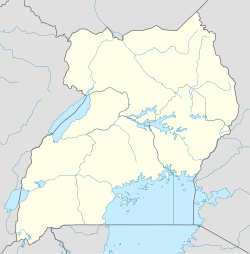 Pakwach is a town in the Northern Region of Uganda. It is the main commercial, political and administrative center of Pakwach District. Pakwach is in Pakwach District, West Nile sub-region. It is approximately 20 kilometres (12 mi), by road, east of Nebbi, the nearest large town. This is approximately 131 kilometres (81 mi), by road, southeast of Arua, the largest city in the West Nile sub-region. This is along the western bank of the Albert Nile, approximately 120 kilometres (75 mi), by road, southwest of Gulu, the largest city in the Uganda's Northern Region. The Gulu-Arua road bridge at Pakwach is the only bridge in Uganda that crosses the Albert Nile. The coordinates of Pakwach are 2°27'43.0"N, 31°29'54.0"E (Latitude:2.461944; Longitude:31.498333). The 2002 national census estimated the population of the town at 17,625. The Uganda Bureau of Statistics (UBOS) estimated the population 21,700 in 2010. In 2011, UBOS estimated the mid-year population of at 22,300. In 2014, the national population census put the population at 22,360. On 3 November 2013, Pakwach was the centre of Uganda's solar eclipse celebrations. Thousands of locals were joined by solar eclipse tourists and professional observers. The official celebration, which took place at a primary school 10 kilometers from the town of Pakwach, was attended by three kings (Rwothi), Uganda's President Museveni, and cabinet ministers. The following additional points of interest lies within the town limits or near its edges: (a) the offices of Pakwach Town Council (b) the offices of Pakwach District local government (c) Pakwach central market (d) the northwestern corner of Murchison Falls National Park, a few kilometers east of Pakwach (e) the Karuma–Olwiyo–Pakwach–Nebbi–Arua Road passes through the middle of town in a general east to west direction and the proposed Pakwach Campus of Muni University, housing the Faculty of Fisheries and Aquaculture Uganda Christian University, with its man campus in Mukono, maintains a campus in Pakwach. ^ a b UBOS (27 August 2014). "The Population of The Regions of the Republic of Uganda And All Cities And Towns of More Than 15,000 Inhabitants". Citypopulation.de Quoting Uganda Bureau of Statistics (UBOS). Retrieved 24 February 2015. ^ PRO (2 July 2017). "The new Pakwach District has been operationalized". Radiopacis.org (PRO). Retrieved 5 August 2017. ^ GFC (5 August 2017). "Distance between Pakwach, Northern Region, Uganda and Nebbi, Northern Region, Uganda". Glbefeed.com (GFC). Retrieved 5 August 2017. ^ GFC (5 August 2017). "Distance between Arua, Northern Region, Uganda and Pakwach, Northern Region, Uganda". Globefed.com (GFC). Retrieved 5 August 2017. ^ GFC (5 August 2017). "Distance between Pakwach, Northern Region, Uganda and Gulu, Northern Region, Uganda". Globefeed (GFC). Retrieved 5 August 2017. ^ Google (19 July 2015). "Location of Pakwach at Google Maps" (Map). Google Maps. Google. Retrieved 19 July 2015. ^ UBOS. "Estimated Population of Pakwach in 2002, 2010 & 2011" (PDF). Uganda Bureau of Statistics (UBOS). Retrieved 24 February 2015. ^ Steven Candia, and Benedict Okethwengu (4 November 2013). "Thousands view total solar eclipse in Pakwach". New Vision (Kampala). Retrieved 24 February 2015. ^ Oleny, Solomon (28 October 2013). "Sites And Sounds of Uganda: more than the eclipse at Pakwach". New Vision (Kampala). Retrieved 24 February 2015. ^ Ssenkabira, Al-Mahdi (24 February 2015). "Mixed reactions as West Nile gets first University". Daily Monitor. Kampala. Retrieved 19 December 2011. ^ Mobile Monitor (13 November 2013). "Know Your Hood: Pakwach, the home of the leopards". Daily Monitor Mobile. Kampala. Retrieved 5 August 2017.